Japanese Episode AG 165: "Fierce Fighting! A Jungle Battle at the Battle Palace!!" American Episode 435: "Ka Boom With a View!" The time for Satoshi's fifth Frontier Brain battle has arrived! Since the weather is so nice, Ukon decides to have the battle outside in his jungle battle field. The three-on-three match begins with Satoshi's Jukain facing off against Ukon's Dartengu. The two grass pokemon chase each other around the jungle until they reach a waterfall. There, Dartengu is able to shove Jukain over the edge with a Rock Smash attack, but Jukain is able to survive it and knock Dartengu out with a powerful Pound and Leaf Blade attack. Ukon's second pokemon is Fushigibana, so Satoshi calls on his Heracross (who he had sent over from Orchid-Hakase's lab) to battle. 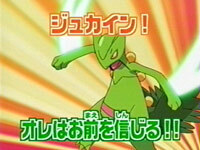 The bug-type pokemon seems to have the advantage until Fushigibana unleashes a powerful Solar Beam attack that takes Heracross out with one hit! A desperate Satoshi chooses Ohsubame as his final pokemon. The bird-type lures Fushigibana toward the beach where a series of clouds prevent the pokemon from using its Solar Beam. As the grass-type pokemon is startled, Ohsubame manages to take out Ukon's pokemon with an Aerial Ace. The Palace Guardian is forced to call on one last pokemon: Nendoll. The adverse weather that had hindered Fushigibana helps Nendoll defeat Ohsubame, forcing Satoshi to call his Jukain back into battle. As Nendoll issues attack after attack, the seeds on Jukain's back take in sunlight and enable it to use a Solar Beam of its own! Jukain is able to defeat Nendoll with its new attack, earning Satoshi the Spirits Symbol! Now, Satoshi only has two more Frontier Brains left in his Battle Frontier challenge. Can he defeat them both? For a while, the Frontier Brain battles haven't really done much to differentiate themselves from regular ol' Gym Battles. Datsura had a legendary pokemon, Kogomi had that wheel, Heath had that big stadium, and Azami had...a fetish for things with squinty eyes? The Frontier Brain battles have been pretty standard, but luckily, Ukon decided to break the mold. Having the battle in an outdoor jungle arena was just the thing to make this battle stand out and really made the battle seem more important than all those Gym Battles Frontier battles that came before. Now I think the battle itself is good even if the fluctuating weather is a bit too "golden armor Pikachu and Ohsubame" for my taste. Seeing Heracross again was a great touch, and watching Jukain in its first real battle was a treat as well. The dubbed version, for some reason, renamed the little referee robot. Its original name is Jumecha (ジャメカ...judge + mecha), but for some reason, PUSA calls it "Jamero" instead. The only reasoning I can think of is that PUSA thought the Japanese name sounded too much like Jamaica, but there's no telling at this point. Heracross and Nendoll keep their Japanese voices. Which is strange considering Nendoll's voice got dubbed back in "Claydol Big and Tall." Inconsistent much? At the end of the episode, we can hear Battle Frontier play in the background from the time Jukain learns Solar Beam all the way up to that first shot of the beach at dusk. In the dub, all of that is replaced. Quelle surprise! Three seconds are added to the TO BE CONTINUED screen. Who would have guessed!?!? !